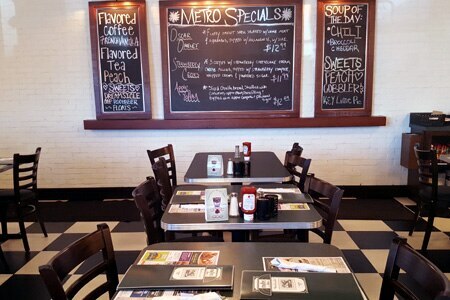 Florida-based chain Metro Diner has arrived in the metro Atlanta area. It is already popular with the locals who throng it for weekend breakfasts with family. Metro Diner, 880 Holcomb Bridge Rd., Ste. 100, Roswell, GA 30076, 678-539-0879. Located in a historic Decatur building, Scout presents an American menu influenced by the Southern flavors with which chef-partner Michael Semancik is so familiar. Stone-ground grits, collard greens and Vidalia onions find companionship with such dishes as clam roll and scallops from New England. Scout, Old Scottish Rite Hospital Bldg., 321 W. Hill St., Decatur, GA 30030, 404-496-6863. Scotley Innis has been named the executive chef of the Atlanta location of Charlotte-based 5Church. The restaurant is situated in Colony Square and specializes in New American cuisine. 5Church Atlanta, Colony Square, 1197 Peachtree St. NE, Atlanta, GA 30361, 404-400-3669. Chef Eli Kirshtein's restaurant The Luminary in Krog Street Market closed at the end of March 2017. The Luminary, Krog Street Market, 99 Krog St., Ste. Y, Atlanta, GA 30307, no phone.